The demand for UN police is increasing due to the recognition that functioning local police is a central element of the UN exit strategy. UN policing was never easy, but the combination of an increasing deployment of UN operations in the midst of on-going wars, and the steady increase of UN police tasks without adequate increases in resources or training, has made UN policing even more complicated in recent years. Examining both the security and trust role of police in society, Osland argues that the main challenge for UN police in post-conflict situations is to close the security–trust gap. So far, most of the focus has been on the security aspects. The chapter asks whether the UN is set up to achieve both. However, the 2016 report on the “External Review of the Functions, Structure and Capacity of the UN Police Division” (henceforth the External UN Police Division Review) calls for a paradigm shift in UNPOL’s operating model in order to have a better chance of achieving results (UN 2016a). This is partly based on an understanding that, while there has been a steady escalation of tasks to be performed by the police (UN 2000a, 2015a), this has not been matched by a change in the operating model of UNPOL, resulting in a large expectation-implementation gap (2016b, pp. 2 and 12).5 For instance, while some of the tasks are short-term, such as the protection tasks, others focus more on the restoration of trust, requiring a transformed behaviour if not attitude, and thus asks for a long-term perspective. There seems to be a delicate balance between enforcing security on the one hand and establishing trust on the other. Is the UN set up to achieve both? In this chapter, I start by looking closer at the role of the police in society with a particular focus on trust, before exploring the role of UNPOL, its history, and toolbox. I will then investigate principal reform initiatives in and doctrinal development on UN Policing during the last decades, before I analyse closer what I call the ‘security–trust challenge’. I will end by reflecting on whether the UN is indeed able to both provide security and build trust. Most definitions on policing recognise the police as having a responsibility to prevent and detect crime, to keep public order, and to protect the people. The police can be used as a tool of power; it can also be perceived as a projector of power “with the ability to constrain freedom as well as protect it under its capacity as both a political and a social institution” (Devon 2016). As a projector of power, the police empower individuals and groups through its practices—intended and unintended. Police reform is, therefore, a very political endeavour, challenging the most sensitive sector of the state, namely its instrument of power (Osland 2014, p. 28). The police are supposed to serve the people—as a police service—and at the same time, they are meant to protect the interests of the state—as a police force (i.e. service vs coercion). Mawby (2008) argues that police systems at the control-dominated end of the spectrum tend to be centralised nationally and have a military-like approach, hardly providing public services that address communities. In contrast, at the other end of the spectrum are community-oriented police (COP) systems, whose main function is to provide a service that addresses the wider needs of the community.6 In this latter system, although maintaining order is important, crime is seen as symptomatic of wider social problems and the police service enjoys a high level of legitimacy. In the control-dominated system, the legitimacy of the police force fails to be recognised by the general population. In all types of systems, the police are part of the interface between state and society and constitute an important component of the social contract between the state and its people. In numerous authoritarian states, and in particular in countries experiencing war and conflict, there is no recognised contract between the state and the society, and the police are used by the ruling elite to protect its own interests, habitually violating international human rights. Whether the police are perceived as a projector of power or as a tool of power, and whether there is a recognised contract between state and society, is to a large extent a matter of trust between the people and their governors. Further, in the same document, the UN Secretary-General states that the aim of UN police is to “…enhance international peace and security by supporting Member States in conflict, post-conflict and other crisis situations to realise effective, efficient, representative, responsive and accountable police services that serve and protect the population” (ibid.). Per both quotes, the police’s two key responsibilities seem to be trust and civilian service. One would maybe then assume that (re-)establishing trust in civilian police would be a key task for UNPOL. Nonetheless, the context in which the international police officers are to perform their duties is very often one characterised by fear and distrust between the people and its police—with longstanding histories of abuse and neglect by the police—and where parts of the country may still suffer from war. Since the international police forces most often are perceived as the prolonged arm of the state, given that their main role is to assist the national police, there is reason to believe that these forces are perceived with negative connotations by the people. The first international civilian police officer was deployed from 1960 to 1964 to the UN Operation in the Congo (ONUC) (UN 2003a, p. 84).8 In 1964, the first police component was deployed to the UN Peacekeeping Force in Cyprus (UNFICYP). Over the next 25 years, civilian police were used in UN peacekeeping operations to monitor and report on local police activities. This started to change following the deployment of police to Namibia in 1989, as part of the UN Transition Assistance Group (UNTAG). In 1995, the Centre for Human Rights in cooperation with the Department of Peacekeeping Operations (DPKO) Training Unit introduced the ‘SMART’ concept—an acronym describing the core of civilian police tasks in peace operations: supporting human rights and humanitarian assistance; monitoring the performance of the local law enforcement agencies, prisons, courts, and implementing agreements; advising the local police on humane effective law enforcement, according to the international standards laid down in the conventions, covenants, and treaties on human rights; reporting on situations and incidents; and training the local law enforcement in the best practice for policing and human rights (Hartz 2000, p. 31). While civilian police officers continued to monitor, mentor and advise local police, they also started to assist in the development and restructuring of law-enforcement structures. In the cases of Kosovo and Timor-Leste, and more recently, to a limited degree, in the Central African Republic, they also acted as the authority for law enforcement.9 In addition, in some missions there have been blurred lines between political actors, violent extremist groups, and transnational criminal networks, and the UN has been involved in strengthening host-state capacities to combat violent extremism, and transnational organised crime, as well as, sexual and gender-based violence, for instance in Cote-d’Ivoire, Haiti, Mali and the Democratic Republic of Congo (UN 2016b, p. 5). Further, and as mentioned above, the UN plays an increasingly important role in protecting civilians (Sebastian 2015). Hence, there has been a steady increase, in the numbers of police officers, the complexity of police tasks, and in the number of operations where the police form an integrated part, reflecting the general growth in peace operation but also the relative importance of policing within these missions. Furthermore, the United Nations Development Programme (UNDP) has an important advisory role in the planning and implementation of police reform around the world and has a more long-term focus compared to DPKO. Since 2012, UNDP is designated together with DPKO as the joint Global Focal Point on Police, Justice and Corrections Areas in the Rule of Law in Post-Conflict and Other Crisis Situations (GFP). Other key partners are the United Nations High Commissioner for Refugees, the United Nations Office on Drugs and Crime, the UN Office of the High Commissioner for Human Rights and the UN Women. It is not only the mandates that have changed, but also the policing toolbox of the UN has transformed during the last decades. Today, UN police teams range in size from just a few officers to more than 3500. At the time of writing, there are 11,034 officers, of whom 10% are women, coming from 87 UN Member States and deployed in 16 out of 23 UN operations (UN 2017a, b). The main policing instruments of the UN are: Formed Police Units (FPUs), currently 66%, and individual police officers, currently 34%, including specialised police teams, contracted seconded police, and civilian experts. In addition, comes the Standing Police Capacity. Individual Police Officers are normally police officers but can also be other law enforcement personnel of various ranks and experience assigned to serve with the UN on secondment by governments of Member States.10 Individual Police Officers mentor and train national police officers; they provide specialisation in different types of investigations and in several countries, they help law enforcement agents to address transnational crime. In some cases, they develop community-oriented policing in refugee or internally displaced persons camps. The Standing Police Capacity is the rapid deployment unit of the UN, based in Brindisi, Italy. It has an approved operational capacity of 40 staff members and its core task is to provide technical assistance and start-up capacity to field missions, as well as in non-mission settings through the Global Focal Point arrangement (UN 2016b, p. 7). The Standing Police Capacity consists of people with specialised knowledge and leadership experience, and is to assist in the fulfilment of the strategic mission of the UN Police. Increasingly, UN Member States have established specialised police teams that are deployed in peacekeeping operations. For instance, since 2010 Norway has a specialised police team on investigating sexual and gender-based violence (SGBV) assisting the UN mission in Haiti (Caparini and Osland 2016a, b). Furthermore, some UN Member States have other instruments available, such as the Spanish Guardia Civil, the French Gendarmerie, the Italian Carabinieri, the Portuguese National Republican Guard, and the Dutch Royal Marechaussee, all of which form part of the European Gendarmerie Force, established in 2006.14 Several UN Member States also have a growing private industry offering policing and security services across the globe, including towards UN peacekeeping operations. For instance, in the UK the private security industry offering such services overseas, is now valued at £1 billion (Ellison and Sinclair 2013, p. 3). It seems like the shell of UNPOL has hardened. This is an expected development given the more insecure situations the UN faces. One would assume this is to promote the security of both the UNPOL itself and the people it is there to assist, but what impact can this have on the (re)-establishment of trust? Before going into that discussion, let us now turn to the different reform initiatives and doctrinal developments particularly relevant for UN Police. The most important reform initiatives the last decades in the field of policing have come with the Brahimi Report (UN 2000a), the Secretary-General’s two reports on UN Police (UN 2011, 2016b), the report of the High-Level Independent Panel on Peace Operations (HIPPO) (UN 2015a), the subsequent Secretary-General report (2015b), and the External UN Police Division Review (UN 2016a). In addition, as for doctrinal development, the UN Security Council (UNSC) Resolutions 2185 (UN 2014) and 2382 (2017c) as well as the Strategic Guidance Framework for International Police Peacekeeping (SGF) should be mentioned. These will be briefly explored in chronological order. Given the growth in scale and scope for UN Police peacekeeping, the need for more strategic thinking was stressed by the UN Secretary-General in his first report on UN Police in 2011 (UN 2011). On 20 November 2014, the UNSC unanimously voted for Resolution 2185, the first ever dedicated to policing in peace operations (UN 2014). The discussion showed an overwhelming engagement where every member of the Security Council took the floor (Feller 2014). In this resolution, the Security Council stressed the importance of international policing in peace operations and requested that the Secretary-General further promote professionalism, effectiveness, and system-wide coherence in the policing-related work of the UN, including through the development and implementation of standards and guidance through the SGF. The work on the SGF, started in 2009 by the UN Police Division, has consisted of the elaboration of a set of policies, associated guidelines, and manuals that are to provide a cohesive and coherent framework for UN Police. With the SGF, effective as of February 2014, “…for the first time in the history of United Nations police peacekeeping, the mission of the United Nations police and what core functions and organizational structure should comprise police peacekeeping have been defined” (UN Police 2014).16 In addition to an overarching policy, the SGF consists of four guidelines on police administration, police capacity building and development, police command, and police operations. Mainstreaming the UN’s approach towards international policing should, needless to say, not be confused with applying the same blueprint for all missions. An external review of the UN Police Division was recommended by both the HIPPO report and the subsequent Secretary-General implementation report, on how to improve UN police contributions. In January 2016, a seven-member independent team was assigned to conduct this review and in May, the External UN Police Division Review was delivered.18 One of the challenges identified in the report, is that the current model relies on having a high number of Individual Police Officers deployed on a short-term rotation to fulfil a capacity- and institution-building mandate that they are not trained to perform and that is complex and long-term in nature (UN 2016a, para. 34a). The need to strengthen the gender focus and the number of female police officers in UN peace operations is another challenge mentioned in the HIPPO report (UN 2015a, para. 165), in the 2015 Global Study on the implementation of UNSC Resolution 1325 (UN Women 2015), and in the 2015 review of the Peacebuilding Architecture (UN 2015c). Police officers are more efficient when the different needs, concerns and experiences of women and men are taken into account when assisting in rebuilding the police in post-conflict societies; it increases the overall trust in the police, and presents opportunities to promote gender equality by, for example, establishing more inclusive national police services (Osland 2017a, b). As of November 2017, there are 1081 or 10% female police officers deployed, hence, there is still a long way to go (UN 2017a). In 2016, the UN Secretary-General’s second report on policing was launched.19 There, a vision for a “…people-centred, modern, agile, mobile and flexible, rights-based and norm-driven” UN police was presented, and 14 recommendations were put forward to realise that vision (UN 2016b, pp. 2–3). These recommendations were further emphasised with the UNSC Resolution 2382, adopted in November 2017. The resolution stressed the role of UN policing in peace operations throughout the conflict cycle. It further recognises that improved performance of UN policing can contribute to the success of exit strategies and to the protection of civilians, including in preventing and addressing sexual and gender-based violence. Also, it supports implementation of the SGF, the need to give clear, credible, achievable, appropriately resourced mandates for policing-related activities, and emphasise the need to ensure a UN system-wide approach to the rule of law, including through the Global Focal Point. It also urges police-contributing countries to ensure comprehensive training for deployed police and to substantially increase the numbers of women officers and their representation in leadership positions. Through all of these reports and resolutions, much knowledge about challenges and best practices has been put on the table. However, there is still a large gap between this and what is being implemented. One of the main reasons why it is so difficult to succeed is simple: UN policing is an enormously challenging endeavour. It was never easy, but the increase in tasks to be carried out, combined with a system that is not set up to manage the new reality of tasks, mandates, and problems, only adds to the challenge. If looking at what is being done in UN missions on policing, one might get the impression that the main purpose is to strengthen the existing police, whatever type of police that may be. This is because a large part of the activity consists of rebuilding, equipping, and training the police forces. UNSC resolutions occasionally state that peacekeepers will assist in reforming the national police in line with the principles of democratic policing but more often, they mandate peacekeepers to train police forces. In the original mandate for the UN Mission in Liberia (UNMIL) it is stated that the mission shall do both “…assist the transitional government of Liberia in monitoring and restructuring the police force of Liberia, consistent with democratic policing, to develop a civilian police training programme, and to otherwise assist in the training of civilian police…” (UN 2003b, para. 3n). However, the implementation of these mandates seems to focus on the more “technical” parts, stressing the training, rebuilding, and equipping of the national police forces, and less on the more long-term issues that will contribute to (re-)establishing trust (Osland 2014). There are several reasons why this is the case (ibid.). First, it is not uncommon that the most basic of police equipment is lacking, that there are none or devastated police stations or training centres, and that the war has lasted so long that it is imperative to start afresh, establishing a new force with updated training etc. Second, the mandates are normally not long-term, and the training, rebuilding, and equipping of the police can be expected to show relatively quick and tangible results. On the other hand, the reforms to make the police more accountable, in accordance with democratic standards, and increasing the trust of the people, demand a long-term perspective. The progress and results of this latter work is almost by definition very difficult to measure. Third, while there may be much disagreement between the national government and international actors on the goal and strategies for the way ahead, it is frequently the case that national and international actors would concur on the need for new equipment and buildings—they are not perceived as very sensitive. Fourth, the changes can be performed relatively independent of other reform initiatives. While all of these activities may contribute to a necessary re-building and investment, if this is the only thing that is done, it mainly contributes to one part of what seems to be the main goal for the international intervention; it contributes to increasing the security part but it does very little as for the trust-building part, except for the fundamental fact that if people do not experience basic security, trust will not prevail. This leads us to what I will call the security–trust challenge. If the purpose for the UN work on policing does not include (re-)establishing such trust, then that needs to be made clear from the beginning. The HIPPO report echoes the need for realism as for what can be achieved within its lifespan (UN 2015a, para. 161). Also, the External UN Police Division Review is clear in its criticism in this regard: “a paradox exists between the supply of a large number of regularly rotating personnel, usually police generalists, who are deployed to United Nations missions, and the long-term qualitative and structural challenges they are expected to address” (2016a, p. 8). Compared to 20 years ago, there has been considerable progress in some areas, for instance, a larger focus on local ownership as imperative for sustainable reforms (Donais 2015); an understanding that more technical reforms are also highly political through the empowering of some and disempowering of others (Osland 2014); as well as an increased understanding that police reform, like reform of the larger security sector, implies a changed way of thinking about reforms rather than a given set of actions (Osland 2015, pp. 31–33). Nevertheless, the ongoing changing landscape of conflicts merits a continuous process of change in our understanding of how to handle these new challenges. During the last two decades, both the mandates and the tools of the UNPOL have changed: with nine Formed Police Unites (FPUs) in 2000, to 71 authorised FPU’s in 2016. This development has happened in a context of a constant lack of resources; more robust mandates focusing more on protection of civilians and combatting violent extremists’ groups, on which the police officers often have received little specific training; UNPOL officers from 87 countries, all with their own principles and structures, not to forget the context that is often characterised by distrust between the general public and the police in the host-state. It goes without saying that assisting in the restoration of state authority in such a context, represents a very serious challenge; in particular seen from the perspective of those citizens who are not represented by the political elite at a given time, but also seen from the perspective of the UN, that not assisting in restoring state authority is not perceived as an option since the alternative is that non-state and often criminal actors will take advantage of any security and governance vacuum. What may represent an even greater challenge is the restoration or establishment of trust between the host-state police and its people. In order to achieve this, a different timeframe is needed and probably also a different approach—less top-down and more bottom-up. An increased focus on community-oriented policing is a step in the right direction. The extent to which external actors, such as the UN, can indeed contribute towards increased trust between people and its police, is a different matter. So, is UNPOL fit for purpose? At first glance, it is tempting to make a connection between the equipment used by the police—and argue that its hardened shell represented by its increasing number of FPUs—will be counterproductive to establishing trust. Yet, this is a simplified argument; it is about how the police behave, not how they are equipped. If the operational situation requires a more robust set-up, it will not contribute to establishing trust if the police is neither equipped nor organised to handle the challenges, quite the contrary. For the police to be perceived as legitimate, it needs to simultaneously be perceived as efficient. Trust is first and foremost connected to attitudes and behaviour and how the police treat the people it is set to serve. However, if UNPOL is supposed to be a community-oriented service, as stated in the SGF, something that could in fact contribute towards increased national ownership and hence, add to the security–trust challenge, then UNPOL is not fit for purpose. While the strategies are there, saying that community-oriented policing should be an overarching approach for international assistance in post-conflict countries, the implementation of a community-oriented policing strategy is lacking. We live in an era where there is a lot of scepticism about the UN and its ability to perform in the peace and security arena. While the UN often gets blamed for the failures, the ultimate responsibility lies with Member States. The UN Secretariat can support Member States, but they cannot replace them or make up for the lack of political will among them. This chapter was prepared as part of the Community-Based Policing and Post-Conflict Police Reform Project (ICT4COP), which has received funding from the European Union’s Horizon 2020 research and innovation programme under grant agreement No. 653909. Also reflected in investments by the EU and the UN (Peake and Marenin 2008, p. 61; Devon 2016, p. 1). Exemplified in Timor-Leste, Sierra Leone, and Liberia (UN 2016b, pp. 4 and 9–10). UNPOL homepage on FPU, see https://police.un.org/en/formed-police-units-fpus. See also UN (2016c, p. 3; Sebastian 2015). For more on the contextual-conceptual divide, see Chana (2002), Sedra (2010), and Osland (2014, p. 4). The concept of community-oriented policing is somewhat vaguely defined. For more, see Rosenbaum (1994), Brogden and Nijhar (2005), Reisig (2010). See also the EU2020-funded project, Community Based Policing and Post-Conflict Police Reform (ICT4COP). 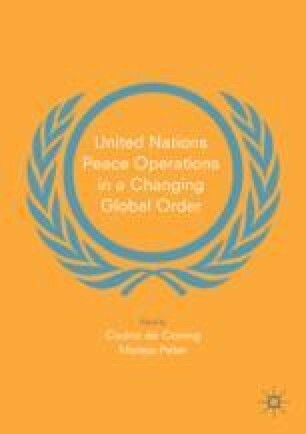 I use the concept ‘post-conflict’ in this chapter, reflecting not only those countries where war has stopped, but also those where there has been a relapse of conflict in parts of the country and the UN has a policing presence. From its first deployment in 1960 and for 45 years following, the UN police forces were termed CivPol (Civilian Police). In 2005, the name was changed to UN Police (UNPOL). EULEX, the EU’s mission in Kosovo, also has executive policing authority under UNSC Resolution 1244 (UN 1999). As of November 2017, the five largest police contributing countries are (in decreasing order): Senegal, Rwanda, Egypt, Bangladesh and Jordan (UN Police 2017b). As of November 2017, FPUs are deployed in 7 missions. The FPU contributors include Bangladesh, Benin, Burkina Faso, Burundi, Cameroon, China, Djibouti, Egypt, Ghana, India, Indonesia, Jordan, Mauritania, Nepal, Nigeria, Pakistan, Republic of Congo, Rwanda, Senegal and Togo. See UN (2017a). The first FPU (from Ghana) was deployed as part of the UN Operation in the Congo (ONUC) from 1960 to 1964 and a similar unit was established in Bosnia and Herzegovina in 1998, called Multinational Specialised Unit (Hansen 2011, p. 1). UNPOL https://police.un.org/en/formed-police-units-fpus (accessed 21 April 2017). For more, see Treaty of Velsen (2007), Arcudi and Smith (2013). Operational in October 2007 with the UN Mission in Chad (MINURCAT). Earlier documents with a comparable function were the UN Civilian Police Principles and Guidelines (2000b), the UN Police Handbook (2005), and the UN Criminal Justice Standards for UN Police (2009). Interview May 2016 in New York with two Police Commissioners in ongoing UN missions in Africa. The Under-Secretary General of Peacekeeping Operations, Hervé Ladsous, appointed the team, consisting of Hilde Frafjord Johnson, Norway (co-chair); Abdallah Wafy, Niger (co-chair); Ahmad Alsayaydeh, Jordan; Benazir Ahmed, Bangladesh; Janine Rauch, South Africa; Serge Rumin, France; and Mark Kroeker, United States. This report was a response to the External Review (2016a) as well as to Security Council Resolution 2185 (UN 2014). Norway has been one of the driving forces behind the SGF-process, as one such example. UN Police. 2017a. Formed Police Units (FPUs). United Nations Police. https://police.un.org/en/formed-police-units-fpus. Accessed 3 Jan 2018. UN Police. 2017b. Police Contributing Countries. United Nations Police. https://police.un.org/en/police-contributing-countries. Accessed 3 Jan 2018. United Nations. 2017a. Mission and post, 30 November. United Nations Peacekeeping. https://peacekeeping.un.org/sites/default/files/mission_and_post.pdf. Accessed 3 Jan 2018. United Nations. 2017b. Peacekeeping Fact Sheet Oct 2017. United Nations Peacekeeping. https://peacekeeping.un.org/sites/default/files/pk_factsheet_10_17_e_3.pdf. Accessed 3 Jan 2018.